By hungry runner on February 27th, 2013 . Filed under: Blogs, Cupcake Ideas, Recipes . 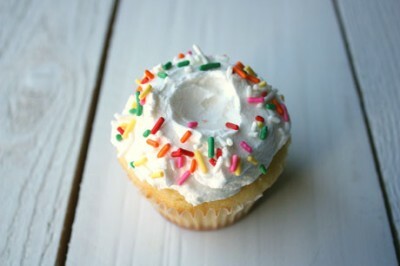 As much as I love all the crazy and unique cupcake flavors my favorite cupcake is usually a simple vanilla cupcake. I noticed She Makes and Bakes blog post for the perfect vanilla cupcake and it peaked my interest. My favorite vanilla cupcakes usually have real vanilla beans in them in addition to vanilla extract so we will see how these, which only call for extract, turn out. I haven’t tried these cupcakes yet as I decided to give up desserts for lent but as soon as Easter arrives I’m going to test these out. Click “continue reading” for She Makes and Bakes’s recipe. In a large glass measuring cup or bowl (preferably with a spout), whisk together the eggs, milk, and vanilla. With the mixer on medium low speed, add the wet ingredients in three parts, scraping down the sides of the bowl as you go. Beat until all the ingredients are incorporated but don’t overmix. Fill the cupcake liners 2/3 full or with about 1/4 cup of batter. Bake until a toothpick comes out clean, about 17-20 minutes (*high altitude about 16-18 minutes*). Place the cupcakes on a paper towel to cool completely. To make the buttercream, place the butter, milk, salt, and vanilla in the bowl of an electric mixer. Mix on medium using the paddle attachment (or use a hand mixer) until everything is blended.Add in half the powdered sugar and mix on low until combined. Add in the shortening and mix on medium until smooth. Scrape down the sides of the bowl. Add in the rest of the powdered sugar and mix on medium high until smooth. Scrape down the sides of the bowl again and mix until smooth. If the frosting is too thick, you can add more milk one teaspoon at a time.